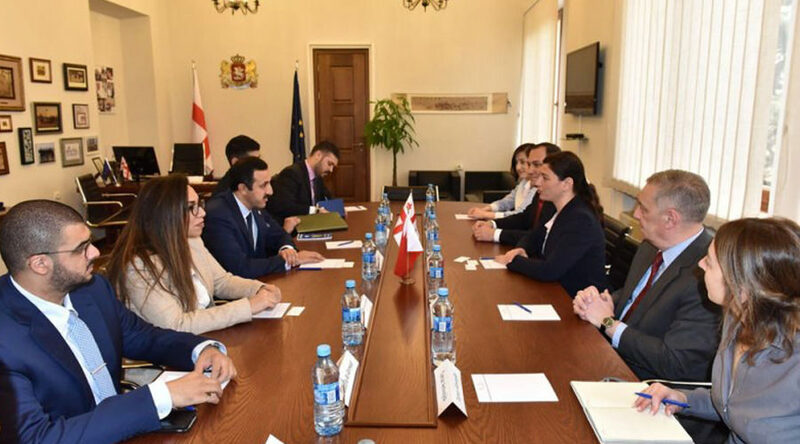 Dr. Abdullah Al Khalifa, Chairman of the Board of Trustees of the Bahrain Center for Strategic and International Studies and Energy, met with Mrs. Eka Metrevelli, President of the Georgian Foundation for Strategic and International Studies, during his visit to the Georgian capital of Tbilisi. Dr. Al Khalifa noted the ongoing strategic changes in the Gulf and South Caucasus regions, both facing Iranian challenges to regional security. He pointed out that the Mullahs’ regime in Iran is experiencing an escalating crisis with severe internal problems and externally with the Islamic Military Coalition to Combat Terrorism, which has crystallized an international position on the importance of curbing Iran’s influence in the region. During the meeting, Dr. Shaikh Abdullah bin Ahmed Al Khalifa listened to a brief explanation on the Foundation’s activities and issues of interest. He expressed his hopes to enhance cooperation between the Foundation and the Studies Center in the areas of strategic thinking, capacity building and contributing to the development of bilateral relations.